After several weeks with no events worth blogging about, I get to post about two band concerts. 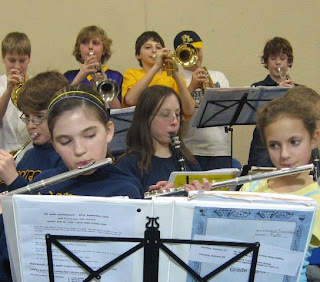 Last night (Friday) Hayley was a part of the 6th grade band that played at the high school basketball game. Fortunately, this concert allows the parents to get up close and personal during the playing of music so I was able to get a good picture of Hayley playing her (my) clarinet. The band did a fine job! Then today, Paul spent all day in Mankato at the South Central Minnesota Band Director's Association 9th and 10th grade Honor Band recital. They learned three songs in five hours and put on a good performance. Paul says it was weird because the director didn't direct like Mr. K does (Paul's band director at school). Jim and I drove down for the concert. Then I got a picture of the five participants from our high school after the concert. L to R: Andrew D, Paul, Katie M, Charlie B, and Max N. As you can see, the guys from PL have all lettered in something (they look like they are in uniform). Poor Katie is the lone non-letter-jacket wearer. As everyone was leaving, the PL group gathered en masse in the auditorium lobby to make sure everyone was ready to go. But there was no Paul or Andrew. Then Andrew showed up and said Paul was already at the school van. Poor little Paul, who frequently has no clue what is going on, had wandered out in the cold, thinking that he needed to go to the van. Jim called him on his cell phone (aren't we glad we gave one to Paul? Yes!) and told him we were all looking for him. Paul had a sheepish look on his face when we finally caught up with him. Always he is the one who has misunderstood the directions. And that is the end of the musical update. Wow, to see Hayley playing her instrument makes her look so mature and grown-up. Poor Paul! I suppose this will be the story of his life, huh? I'm sure he'll survive, but it is a good thing you gave him his own cell phone.